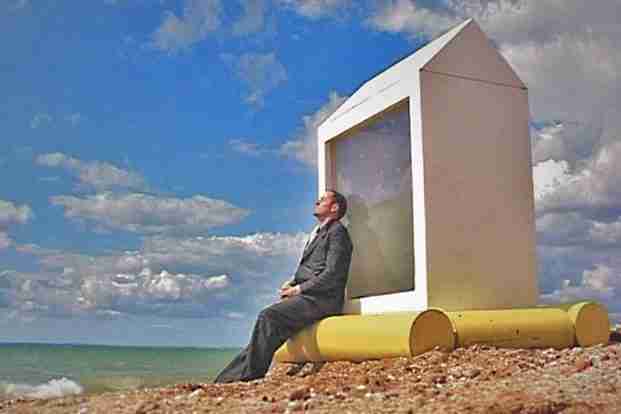 'Sea House' shows a man trapped in his house as the sea rises to engulf it. Performed by Jake Oldershaw. Conceived and designed by Simon Daw and Alistair Gentry. It was inspired by the vulnerability of people in coastal areas to rising sea levels, erosion and the power of natural forces. Since it was made, it’s taken on a new significance in the light of the Asian tsunami and the hurricanes that have devastated New Orleans and the southeast of the USA. Performed at Aldeburgh Festival 2003. Reconsidered and filmed in 2004, shown at New Forest Pavilion, Venice Biennale and the Video and Digital Arts International Festival in Girona, Spain.